This is a short account of our infrastructure safari through Heaton, code name: SCR6 Benfield. The concept of Strategic Cycle Routes (SCR) in Newcastle is well established and monies from the Cycling City Ambition Fund (CCAF) have been earmarked to build part of them. So, earlier on in the year we came up with a plan – we thought it would be useful to ride them and assess how much needs to be done to make them safe, convenient, direct and attractive while connecting places of interest such as schools, shops and employment centres. The SCR network is the backbone of the Newcastle Cycling Strategy; as such it is key to increase levels of everyday cycling. It serves two purposes: make cycling safer for everybody and get more people on a bike – in particular those under-represented groups: children, women and older people. The Benfield SCR route, which connects the city centre to the Coast Road, was scoped out in 2012 by a sub-group of the Newcastle Cycling Forum. 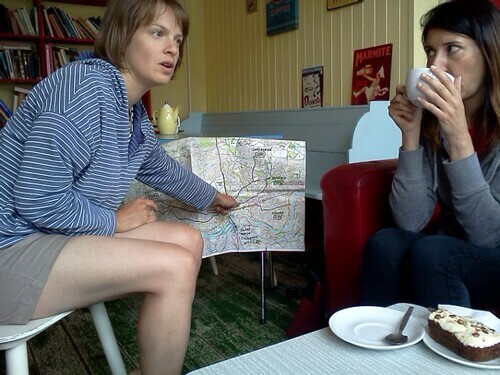 On Saturday 9 August, we followed this route on our infrastructure safari and stopped at different locations. About ten people gathered at the Civic Centre before heading off east. After a stop at the City Stadium, where works had started a few weeks ago to broaden the pedestrian/cyclist track, we rode on the residential streets, crossing Stratford Road, Heaton Park Road and Heaton Road. It became obvious that crossings are a major barrier to the route. First of all, we had to give way to all traffic as North-South routes get priority. The regular interruptions certainly made us feel that continuity was lacking. Visibility was poor, in particular at the Heaton Park Road crossing, with parked vehicles blocking the view and making it difficult and uneasy to get across on a bike. 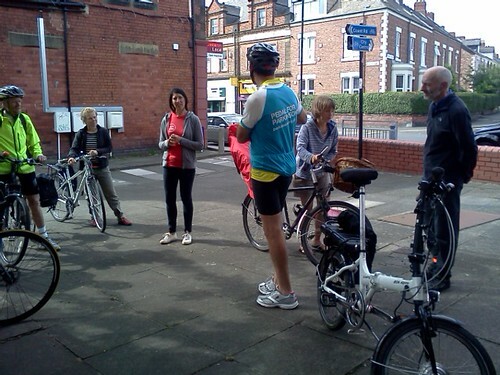 The Heaton Road crossing, where we stopped as shown on photo 2, generated a lot of discussion. There is much more motorised traffic on this road and no infrastructure to allow cyclists to safely cross the road. Further east, crossing Chillingham Road to get onto Spencer Street is facilitated by a traffic light (photo 3), but alignment and visibility could be improved making it more convenient for cyclists going further East. 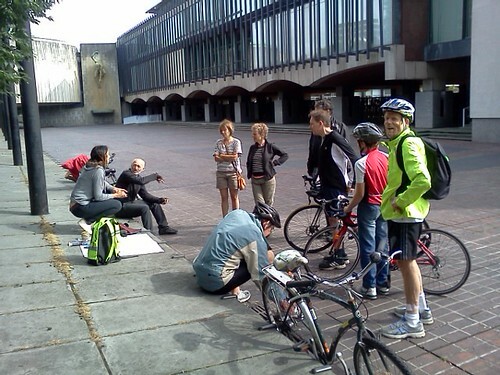 The group also discussed how it felt like riding along the East-West residential streets. Extensive on-street parking and two-way systems for all traffic do not prioritise cycling. We were left thinking that no matter how much more signage SCR6 could get, it still wouldn’t feel like being on a strategic cycle route. Vehicle traffic reduction measures and taking a whole area approach to better manage the traffic network would help and definitely require more thinking. This led the group to consider the route itself: a more direct and better aligned route would follow Warwick Street, Heaton Park View to join onto Mundella. An alternative, as pointed out by one of the participants would be to follow the quieter streets along the railway line, but this would make the route even less direct. The route then follows Rothbury Terrace, a 30mph road which leads to Benfield Road. Here the group was unanimous, providing dedicated cycle infrastructure and protection from motorised traffic was essential. And space is definitely not an issue. Discussions continued at a local café with coffee and cakes. If we are serious about creating strategic cycle routes which are both safe enough for the young ones to use and convenient enough for all, then a re-think of our road network is required. Giving priority to cyclists on the route, making it easier and safer for cyclists – as opposed to car drivers, improving the N-S crossings and increasing route visibility by design rather than signage would give Heaton its cycle connection to the city centre. Still a long way to go but we would not start from scratch. The Heaton wards are amongst the 5 wards in the city with the highest level of cycle commuting according to the 2011 Census data. The area underwent a major transformation in the nineties when 20mph limits were introduced and a number of residential streets closed off for motorised traffic. It is now time to go further: a SCR through Heaton, as well as the DIY streets run by Sustrans will re-start the engagement and thinking process around the local traffic network management. And give Heaton a more attractive environment, choice of travel and a more sustainable future.